Lapis lazuli is a blue rock made up of different minerals. It is usually found as boulders or within limestones. 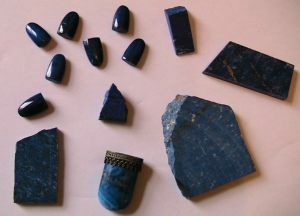 The best quality lapis is found in Afghanistan. Other locations include Argentina, Chile, the USA, Russia and Canada. It can be ground down to a fine powder and used as a blue pigment known as ultramarine. Chemical composition: Rock containing Lazurite and other minerals including sodalite, hauyne, calcite and pyrite. Lapis Lazuli strengthens skeletal system, activates thyroid gland, releases tension and anxiety, energises throat chakra, augments strength, vitality, virility, facilitates opening of chakras.A powerful augmenter of psychic abilities and communicator with the higher self, inspiring greater creative expression and illumination. It enhances psychic abilities and communication with higher Self and spirit guides, creative expression. Helps with wisdom, patience, truth, artistic expression, and personal integrity. It is believed to attract good fortune and success in love, increase concentration, strengthen instincts, and promote cheerfulness. Lapis Lazuli is associated with the star signs Gemini, Sagittarius and Pisces. Both the 17th century astrologer William Lilly and the famous mineralogist George Frederick Kunz in his 20th century book 'The Curious Lore of Precious Stones' associated it associated it the planet Venus. Lilly also linked it to the planet Saturn. Modern thought links it to the planet Neptune. Lapis Lazuli activates Ajna, The Third Eye Chakra ( 6 ) and Vishuddha, the Throat Chakra ( 5 ).